The new season, in calendar if not fisherman on the bank terms, is already well underway. It has been a relatively strange one with air and water temps reminiscent of late March, April and even, on one shirt sleeve day I fished, May. Highly unusual although the blank I recorded on that occasion was not! As it is not a traditional spring (although when was the last time we had rivers in May flowing bank high with snowmelt a la tales of yore?!) many of the usual tenets of spring fishing are not applicable. In particular rising water temperatures have meant that the traditional barriers, caulds, bottlenecks, rapids and falls that slow and concentrate spring fish could easily have been ascended should the fish have chosen to do so. What too the correct tactics? A sink 1/2/3 or more or perhaps a floater with an intermediate tippet teamed with a seductive, slim, long winged fly fishing just below the surface? Perhaps the latter if fish are on the move. As in all things salmon both will likely work and both will have their adherents. So what of the fish themselves? Not huge numbers to date, but some good ones amongst them, which gets us through the slow patches. A friend sits at the top of the class having secured a remarkable three Feb springers in a day and I was fortunate to be present to see the warm glow that a 20lber brings as your first fish of the season. The Carron has seen fish well spread and Dounie, Cornhill, Gledfield, Gruinards and I’m sure one or two others have had fish. The Lower Brora started well with three quick fish, Thurso’s beat 7 did it again with their first of the year, the Helmsdale is into double figures, the Naver has had a few and further South the larger rivers would probably like to see one or two more but it is still early and when did we not! Largely I think we are fairly set for March and hopefully increasing numbers of fish but as always only time will tell. Personally I have yet to get off mark but every dog has its day! The photo is not this year’s vintage but does set the scene for a spring cast. Bluebells, the first leaves of the new season and anxiety written large on this fishers face as his springer makes a bid for freedom. (In the interests of fairness I should also dig one out of a blizzard but I suspect that might put one or two off!) 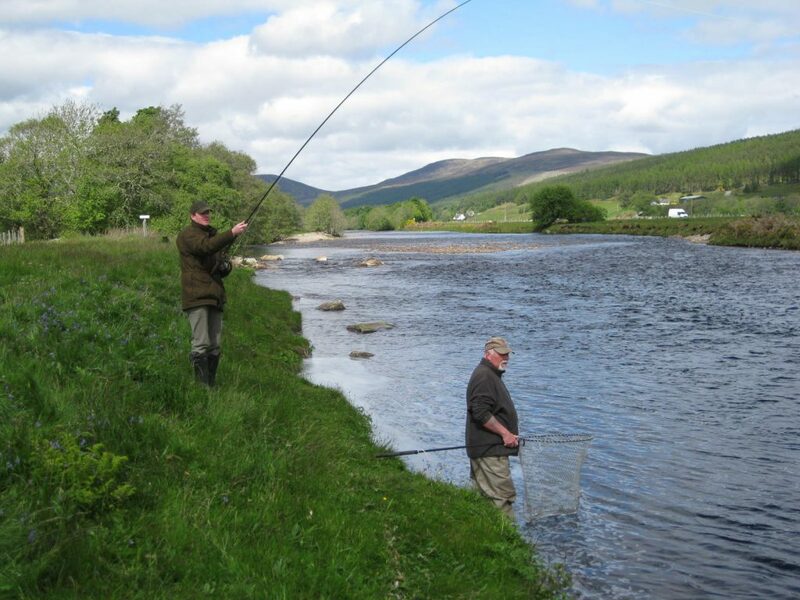 This leads me nicely on to availability and there are still some great options available, 3 days in April and again in May on the Lower Spey, great value slots on the Carron (pictured) from £500 for 2 rods for the beat for a week etc. One thing is certain you won’t catch them if you don’t try.